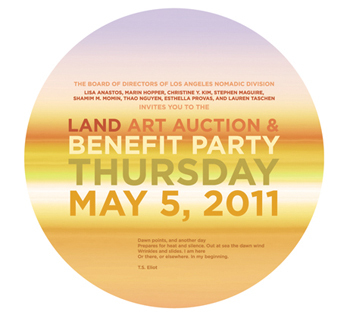 LAND (Los Angeles Nomadic Division) will host its First Annual Art Auction & Benefit Party on Thursday, May 5, 2011 at Palihouse in West Hollywood. The LAND Art Auction & Benefit Party is being hosted by the LAND Board of Directors: Lisa Anastos, Marin Hopper, Christine Y. Kim, Stephen Maguire, Shamim M. Momin, Thao Nguyen, Esthella Provas, and Lauren Taschen. To purchase tickets or for more information, please visit: www.nomadicdivision.org/auction or contact the LAND office at: (646) 620-8289 or info [​at​] nomadicdivision.org. LAND was founded in 2009 by Director/Curator Shamim M. Momin, former contemporary curator at the Whitney Museum of American Art, and board member Christine Y. Kim, Associate Curator of Contemporary Art at the Los Angeles County Museum of Art (LACMA), as a non-profit public art organization committed to curating site- and situation-specific contemporary art projects in Los Angeles and beyond.